Bloomz vs. 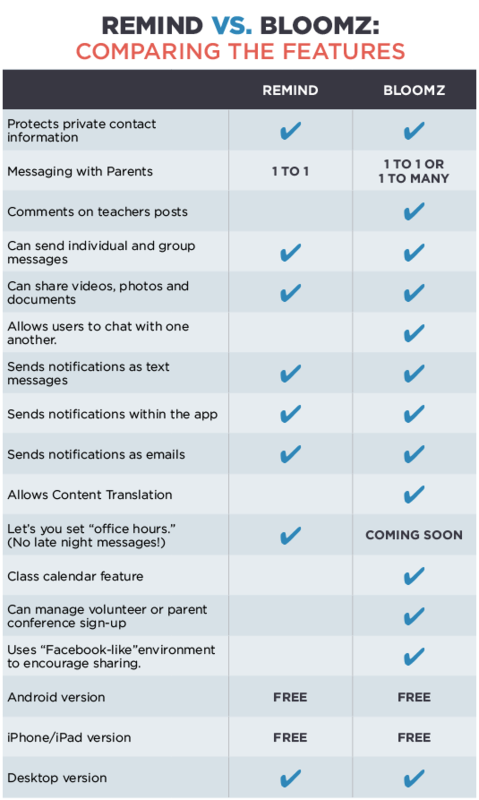 Remind: Which Parent Communication App is Better? Easy ways to stay in touch! Let us guess: You’re pretty sure the answer to parent-teacher communication is not handing out your cell phone number willy-nilly. Sure, sometimes you meet a mom or dad and think “Next year, when your kid is in the next grade, you and I are totally going to be besties.” But others? Well, let’s say that some parents don’t understand that calling at 10:30 at night to ask if Sophia should have done the even- or the odd-numbered problems on page 172 in the math textbook does not qualify as an urgent question. Using a parent communication app can be a great solution for protecting your privacy while keeping your parent emails and messages organized. Two of the most popular communication apps for teachers are Bloomz and Remind. WeAreTeachers reached out to our community to hear what teachers are choosing and how they are using these two apps. We love how easy it’s become to keep parents informed and up-to-date. Teachers used to be limited to weekly backpack notes and a shared phone in the office for the most urgent issues. (Anyone remember incredibly awkward phone calls in front of colleagues in the faculty room? *Cringe! *) Now we can connect with parents in just a few minutes on our smartphones. We love that! The only thing left to decide is which app is the best one for you. Both Bloomz and Remind are efficient when you need to send out group messages. Both apps (available for Android and on iTunes) also keep your private information stored securely so that you are communicating with parents on your terms. You can also use both Bloomz and Remind on your desktop if you’d like. This is especially helpful when you’re doing the heavy lifting at the beginning of the school year to upload all of your student information. So with two great options, which one is right for you? 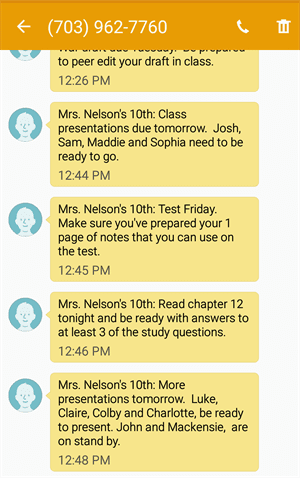 Here’s what students see when they receive a text on Remind. The phone number at the top belongs to Remind, so the students and parents never have access to your personal number. You don’t have access to student numbers either. This app is packed with features. When you post a message (which can include an attachment), parents can comment on or “like” the post, just as they do on Facebook. Because the app includes organizational features like class calendars and digital sign-up sheets, teachers are finding that they can eliminate several different systems and do all of their parent communicating with this single app. You can see the Facebook-like interface on this demo account. Images are featured prominently and there’s room for parents to like and comment on your posts. 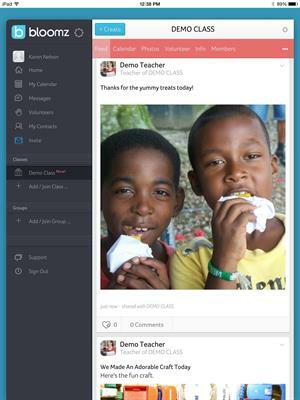 Both apps keep student, teacher and family information secure, and both apps allow teachers to deliver a variety of updates, including images and documents. The difference is that Remind tends to cater to high school teachers who want to communicate with their students (and occasionally parents too). Bloomz, on the other hand, is geared toward helping elementary and preschool teachers communicate with parents. Which one is right for you depends on which features you think matter most. To help make your decision easier, we’ve created a chart that outlines the features of both apps. Remind vs. Bloomz: Who Should Use It? Elementary teachers are frequently drawn to Bloomz. They love the built-in sign-up sheets and calendars. Teacher Tricia H. says, “My co-worker uses Bloomz. She really likes it because she can post things like pictures.” Elementary teachers are also finding that parents use the app to connect with one another outside of the classroom, which helps build community. Parents are getting to know one another and even setting up playdates on Bloomz. Either app is going to save you time and make communication with parents and students so much easier. There are just a few things that set the two apps apart. Managing calendars and sign-up sheets. Preschool and elementary school teachers. Have you used Bloomz or Remind? Let us know what you think! Karen is a Senior Editor at WeAreTeachers. She's also a former elementary school teacher who loves teaching with technology. How Can I Cut Back on the Time I Spend Grading?